I've been searching for this item and happy to find it on this website. I had a small issue with the first order but is was quickly resolved. Thank you! Dimensions 3 in. x 4 in. After having a vinyl card holder that fell apart, and the plastic inserts falling open, I was very happy to see the quality of this leather case. It came beautifully boxed (more important if you were to give it as a gift), and seems to function very well. I can even fit 2 thinner cards in one slot where I need to. I would definitely recommend this. I was looking for a small leather credit card holder and found it! This easily holds 6 credit cards, a driver's license, and a couple of folded bills. This is perfect when you don't want to carry a bulky wallet or have limited space a small handbag. The leather is soft and the stitching is well done. I ordered this in red and the color is true (not orange). This is a great buy. This cardholder is a slim, neat & attractive quality product that stays suprisingly flat even when filled to capacity. Access to cards is quick & convienent. I am completely satisfied & I highly recommend this cardholder. The photo doesn't do this item justice. I like this cardholder so much, I've shown it to my friends and now they want one, too. It's just the right size to slip into a back pocket, and it holds several credit cards and/or ID cards, as well as room for some legal tender. I bought the red one and it's gorgeous, with a very nice feel to the leather and definitely professionally made. I am very pleased with this purchase. Beauty and quality at such a great price is hard to find. The packaging, impression and leather feel were all good...it's certainly a nice product. But if you're looking for a wallet...keep looking. Since I had entered "men's wallet" into the search and a couple of the reviews mentioned it held bills, I thought this would work. But it's REALLY tiny...it holds cards - but doesn't accommodate bills, change or anything other than thin plastic or card stock cards. I wanted it for a gift but had to return it. It just wasn't practical for day-to-day. I would recommend as strictly a specialized card holder...not a small wallet function. This is so nice and handy not bulky. Just perfect for my credit card. I am planning to order the red one als. The cardholders are made of soft leather and come in a nice box. Great gift item! This is my second time buying this wallet. The first one lasted about 3 years, until the plastic ID part started to come apart. It is great. fits in my pocket and has plenty of places to put all my credit cards without having to carry around a purse. 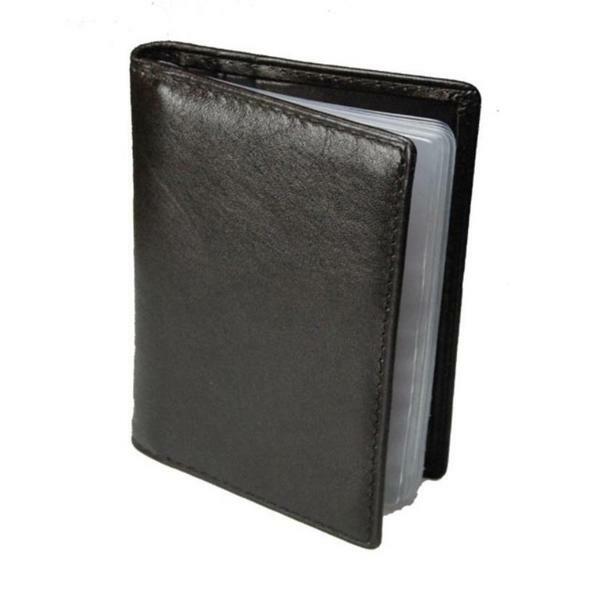 The leather is very soft and the holder can accomodate many cards. This was a present for my father. I bought it some time ago and even when used daily it looks pretty good. It has a good size and various compartments. I love this new wallet. It was just what I was looking for. Fits nicely in my pocket, or in my purse. This is a well made case with lots of slots for cards. Does the job well. I love this product. I will probably order another one. This Cardholder is thin and very soft. I like the wallet and would purchase it again if I needed another. It would work well as an overall wallet for most folks. My husband is very picky with his wallet. He likes them very thin where his license and some cards can be contained. It is a very nice leather and it came to my door within a few days. A good buy! "looking for replacement Trifold 8 Page Wallet Inserts with 2 Tabs 8 page picture size wallet inserts Wallet inserts approximately 2 credit cards thick Loads from inner side Approximate size: 3.88" x 2.94""
Hello Q, thank you for your inquiry. Unfortunately, the information you have requested is currently unavailable. You will receive an email notification once an answer is posted. Have a great day. "how many cards will it hold"
Hello Nemo, thank you for your inquiry. Unfortunately, the information you have requested is currently unavailable. We will continue to try and answer this for you. You will receive an email notification once an answer is posted. Have a great day. We''re sorry. The red wallet is currently out of stock. Please check back. It may be restocked.